Pyruvate oxidation by the pyruvate dehydrogenase complex is a required step before the Kreb’s cycle can begin. The high energy electron carriers NADH and FADH2 then proceed to the electron transport chain to facilitate the production of ATP. In living organisms, glucose is the molecule that is processed to derive energy, in the form of ATP. When a molecule of glucose is taken up by a cell, it is broken down in the cytoplasm into pyruvate during the process of glycolysis. What happens next depends on whether the pyruvate enters the aerobic respiration path or the anaerobic respiration path, before it ultimately allows for ATP production and the release of carbon dioxide (CO2) and water (H2O) as by-products. At the end of glycolysis, two pyruvate molecules are produced that still contain lots of energy that the cell can utilise. The steps that follow glycolysis are pyruvate oxidation and the Kreb’s cycle, which ultimately feed in to the electron transport chain. Pyruvate oxidation is much shorter than the other steps of cellular respiration, it is key in linking glycolysis and the Kreb’s cycle. Firstly, a carboxyl group is removed from pyruvate and released as carbon dioxide. The resulting two carbon molecule is oxidized, and NAD+ acts as the electron acceptor for the lost electrons, forming NADH. The oxidized two-carbon molecule is attached to Coenzyme A to form acetyl CoA. Acetyl CoA carries the acetyl group to the Kreb’s cycle. These steps are carried out by a large enzyme complex called the pyruvate dehydrogenase complex, which consists of three component enzymes and includes over 60 subunits. The pyruvate dehydrogenase complex is a key target for regulation, as it controls the amount of acetyl-CoA that can enter the Kreb’s cycle. 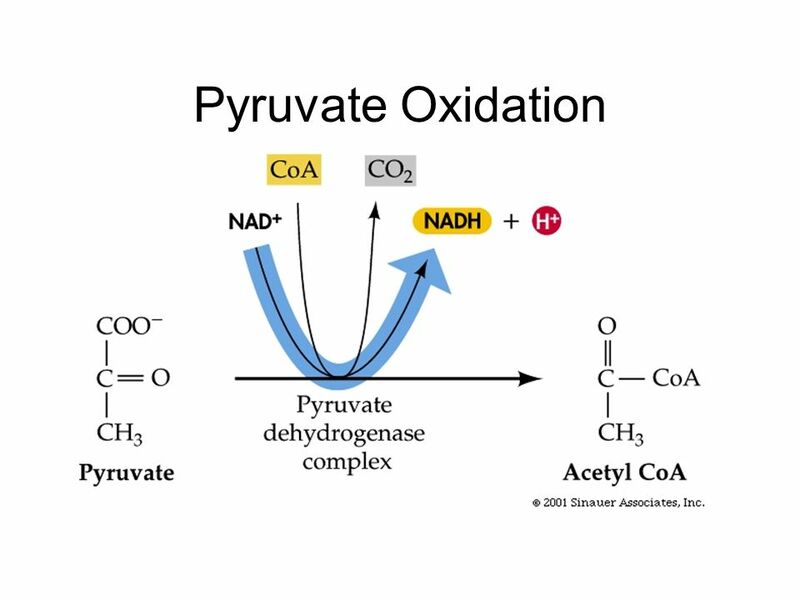 For each glucose molecule, 2 molecules of pyruvate are converted into 2 molecules of acetyl-CoA during pyruvate oxidation, releasing 2 carbons as carbon dioxide and generating 2 NADH from NAD+. Acetyl-CoA serves as fuel for the Kreb’s cycle in the next stage of cellular respiration. The Kreb’s cycle is a series of reactions that take place in the mitochondria of eukaryotic cells. The Kreb’s cycle consists of 8 enzyme-controlled steps. The function of the Kreb’s Cycle is to collect high-energy electrons from the reactions that are carried out during it. These electrons are transported by carriers NADH and FADH2 to future steps in the process of respiration. Firstly, acetyl CoA adds its two carbon group to the first molecule in the Kreb’s cycle, oxaloacetate. This produces citrate. Citrate is then converted to its isomer, isocitrate, by removing one water molecule and replacing it with another. Next, isocitrate is oxidised, reducing NAD+ to NADH, and a molecule of CO2 is lost. This produces the compound α-ketoglutarate. Another CO2 is lost from α-ketoglutarate, and the resulting compound is oxidised, reducing NAD+ to NADH. This intermediate molecule is then attached to coenzyme A, forming succinyl CoA. The CoA enzyme is displaced by the addition of a phosphate group, which is transferred to GDP, a molecule similar to ADP. This forms GTP, and this can be used to generate ATP in some cases. The resulting molecule is Succinate, which is then oxidised, forming fumarate. FAD accepts the electrons from succinate, and is reduced to FADH2. A water molecule is added to fumarate, which rearranges the bonds in the substrate, forming the compound malate. 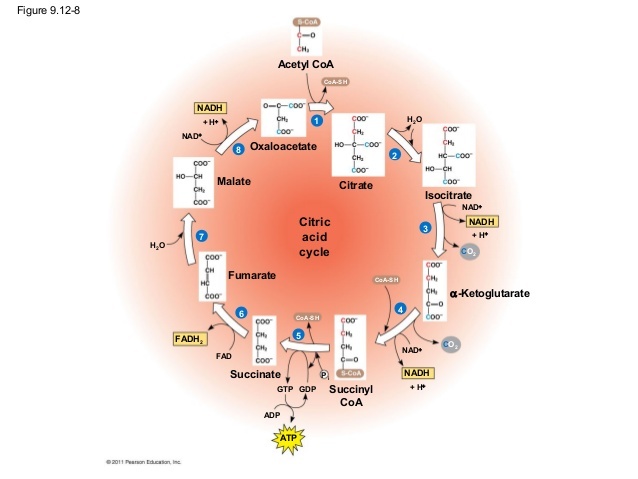 Malate is then oxidised, reducing NAD+ to NADH and regenerating ocalocetate to begin the cycle again. The fact that the same compound both completes and begins the process is why the reactions are referred to as a cycle. The reactions in the cycle are most easily viewed in a diagram, allowing better visualisation of the changes to the molecules throughout the process. Throughout this process, one molecule of acetyl CoA generates 1 ATP, 3 NADH, 1 FADH2, 2 CO2, and 3 H+. Two acetyl CoA molecules are generated from the two pyruvic acid molecules produced in glycolysis, the number of these molecules produced by the Kreb’s cycle is doubled (2 ATP, 6 NADH, 2 FADH2, 4 CO2, and 6 H+). Pyruvate oxidation also generates two additional NADH molecules. NADH and FADH2 move on to the final phase of cellular respiration, where they undergo oxidative phosphorylation to generate more ATP.